Goodbye, lame Facebook photos. Hello, photos filled with cartoon characters! Starting Thursday, you'll be able to add stickers to your photos from Facebook's mobile app on iOS and Android. You'll see a new sticker icon when you upload a photo to Facebook on mobile; when you add a sticker, you can drag it to wherever you want, change the size and rotate it. You can keep or remove the stickers before you decide to upload the photo to Facebook. 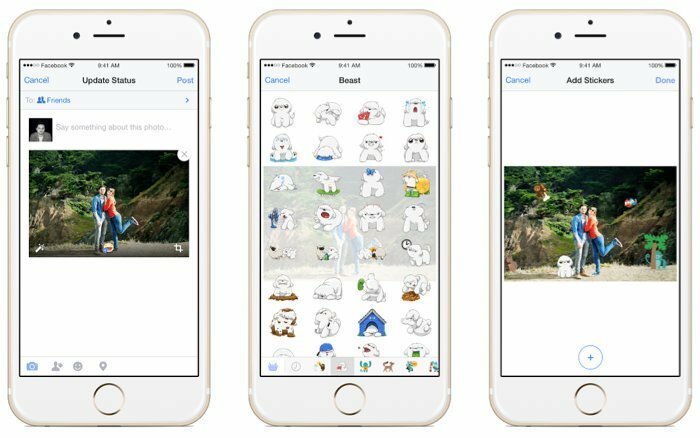 You will probably recognize Facebook stickers from Messenger, where you can send them to your friends. As of last October, you can put them in comments too. Facebook's got a lot of different kinds of stickers to choose from, including images of famous characters like Hello Kitty, Power Rangers and Peanuts. You could previously ad stickers to photos, but you had to use a separate app to do it. This new feature is yet another sign that Facebook is targeting mobile users significantly more than desktop ones. Last month the site told The Wall Street Journal that 85 percent of its users access the site on mobile at least occasionally and more than a third of users access it exclusively on mobile. Mobile's making money, too, since Facebook charges more for mobile ads. Facebook's revenue rose to $2.5 billion last quarter, thanks, in part, to mobile advertising.